Ibecame principal of Cheatham Elementary School in Laveen Arizona in 2008. The school is a Title I school with 72% free and reduced lunch, a 25% ELL population, and a 10% special education population. It is also an incredibly diverse campus with 40% Hispanic, 35% black, 18% white 5% Asian, and 2% Native American. There is also a great deal of socioeconomic diversity. During the four years I was principal, the students displayed huge growth on their Arizona standardized test (AIMS) scores, improved behavior, improved social skills, and improved critical thinking skills. As a result of these positive changes, I was named a Rodel Exemplary Principal in March of 2011 through the Rodel Charitable Foundation of Arizona. The Rodel Exemplary Principal Initiative recognizes the success of Arizona’s most exceptional principals. In the search for Exemplary Principals, Rodel looked for evidence of high expectations for staff and students, as well as a focus on effective teaching and student management strategies. Selected principals are those who inspire their staffs to contribute to school-wide success and the development of a campus that is high achieving, safe, orderly and welcoming. Additionally, individuals are identified who have demonstrated a history of leadership that has earned them the respect of colleagues, students, staff, parents and community members. In turn, as an Exemplary Principal, over the next two years I will mentor three Rodel Aspiring Principals. One of the main reasons for my school’s and my personal successes is the use of Kagan Cooperative Learning Structures. Throughout each lesson and each day, the students were highly engaged in learning through the use of structures. The State assessment results, shown in the graphs, highlight the growth in AIMS (Arizona’s Instrument to Measure Standards) scores. Hear what Cheatham teachers and administrators say about their Kagan experience. Both Math and Reading scores increased dramatically through the use of Kagan. 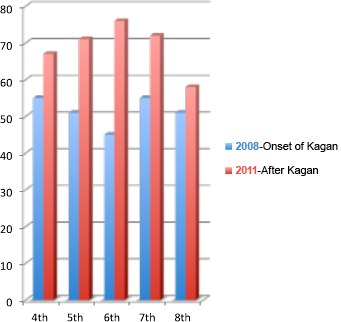 Before Kagan, only 52% and 49% of student received passing Math and Reading AIMS scores respectively. After Kagan, 75% and 71% of student received passing Math and Reading AIMS respectively. 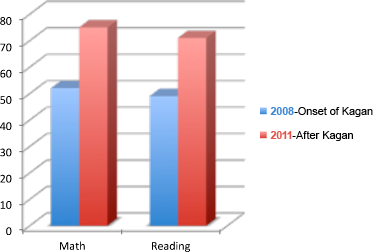 The positive gains were achieved at every grade level in reading. The positive gains were achieved at every grade level in mathematics, with the exception of 7th grade which remained unchanged. 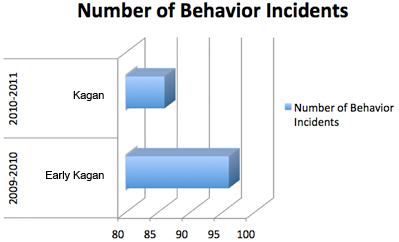 The implementation of Kagan had a dramatically positive impact on student behavior. Negative behaviors decreased while positive referrals skyrocketed with full Kagan implementation. The discipline incidents are reported to Az SAFE, Arizona Safety Accountability For Education. Violations include aggression, drugs, alcohol, harassment, threats, theft, vandalism, weapons and other offenses. 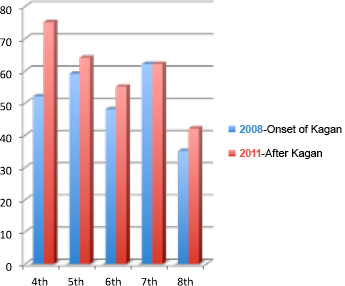 Notice as experience progressed with Kagan, discipline referrals decreased. There was more than a 10 times increase in positive behavior referrals from 46 positive referrals in 2007–2008 to 475 positive referrals in 2010–2011. We would also hear a great deal of praise from outside visitors. Literally every outside visitor, including district office staff, would comment on how polite and well-mannered our students were. At first this surprised me because dealing with the behavior issues on a day-to-day basis I didn’t always see that, but they did. The positive behavior became the expectation and the norm. 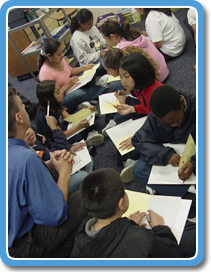 How did the use of Kagan Structures become so ingrained in the school’s instructional culture? Here’s how. Kagan Certification. I attended Kagan Trainer Training and became a Certified Kagan Trainer. The training allowed me to provide my teachers with training as well as increase the engagement at all professional development and staff meetings. Two years later, my instructional coach also became a certified trainer. High Expectations of Implementation. I stated the instructional expectation that each teacher would use a minimum of one Kagan Structure per lesson. I monitored this expectation through the collecting of lesson plans and through extensive informal classroom observations by myself, the assistant principal, and the instructional coach. Mandated Kagan Training. I mandated that every teacher on campus become Kagan trained. Teachers had two options to obtain training. They could either attend the district provided five-day Kagan course or attend a two-day weekend course I taught as a certified Kagan trainer. When hiring new staff members I asked them, "Can you commit to attending either a five or two day Kagan class?" Cooperative Staff Meetings. I modeled my instructional expectation. One of the biggest steps to implementing structures in a school is to model the use of structures during every staff meeting and professional development session. The teachers saw how easily structures could be used, they became excited about the structures we were using, and most importantly, they were able to feel what it feels like to be completely engaged during instruction. They wanted their students to feel the same way during their instruction as they did during training. I lost track of how many times my staff and I would be in training and someone would lean over and say, "We could really use a classbuilder right about now." Coaching and Feedback. I provided feedback. Another big step in implementing structures was feedback, feedback, and more feedback. If a teacher was observed using a structure, we could provide them with tips to improve the structure. More importantly, we could explain when to use a structure, how to use it, and which structure would be appropriate for the activity the teacher was doing. Once the teachers knew how and when to use a structure, the use of one structure per lesson grew to at least three structures per lesson. Extensive Kagan Support Resources. I provided teachers with the materials needed to implement the structures. Every teacher on campus had a full set of Kagan posters, individual student white boards, markers, erasers, and software including spinners, timers, and Numbered Heads Together. I took away all the excuses for not using structures. There was no reason a teacher could not use structures. Creating a Culture of Success. I created a culture of success. Success bred an infectious excitement about Kagan structures; once the teachers saw success, they wanted more. They realized that using structures greatly enhanced the active engagement in their classroom. The enhanced active engagement greatly increased test scores. In addition to taking on the responsibilities of a principal mentor, I have taken on the challenge of taking over the principalship at another school. Madison Camelview, a K-4 campus in the Madison School District in Phoenix, is another Title I school. It has 72% free and reduced lunch and a diverse student population with 3% Asian, 10% black, 56% Hispanic, 11% Native American, and 20% white. Arizona has recently legislated Move on When Reading, mandating students pass the State testing (AIMS) in order to be promoted to fourth grade. By following the same steps as at my previous school, I will ingrain Kagan Structures into the instructional culture and help students and teachers be more successful as we meet the changing demands of relevance and rigor in education.